Nelly 2: Ep.1 is the first installment in the sequel to Black Square Studios' original macabre puzzle platform adventure game, and it will make you go "Huh?" and "Zhuh?!" but also "Oooh" and "Ahh". Little Nelly lives all alone in the deep dark forest, where peril literally waits at every turn. But when she goes out one night, she discovers a friend, and some new abilities, that may take her places she never imagined. Use the [arrow] or [WASD] keys to move and jump, and [spacebar] to interact when a question mark appears above Nelly's head. Not everything you can use is friendly, and in fact most of it is fatal, but the game provides enough checkpoints that the setbacks are only temporary in the wah-wah-waaaah sad trombone way. 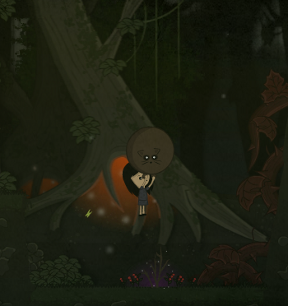 Early in the game, Nelly gains an amulet that allows her to change the forest around her back and forth with the [Z] key, which can allow you to reach places you previously couldn't, or even manipulate obstacles and objects. When Nelly finds her new friend, [X] will allow her to set him down, and then call him back to pick him up again, but by far his most useful ability is to eat any berries you place him next to, which can alter him in ways that will let you get around differently. In a lot of ways, it's a dramatic change over the original both in style and in gameplay. It leans more heavily on puzzles that require a bit of thought this time around, making it feel less like the game is simply there to showcase how purdy the art is. It is gorgeous, though, with its mellow soundtrack and otherworldly visuals, and a myriad of little touches, like the way your little friend anxiously whimpers and hops when you leave him behind, makes for an engrossing experience. The game is, unfortunately, still a little buggy. You can wind up standing around for a while waiting for your fuzzy friend to chow down on a berry, especially if you use your powers to grow a new one. It's also not really what you'd call difficult initially, neither in the mental or platforming sense, and apart from accidentally snapping the kid's neck from a long fall (sorry kiddo, walk it off) you probably won't encounter a whole lot of trouble. It isn't until about midway through the game when a rather gruesome twist is introduced that it becomes a bit more of a challenge, and reflexes come into play in a way that may disappoint players who prefer the more puzzle-like aspects and mood they bring. It does feel like it's working hard to evolve from the much, much simpler game its predecessor was, and that's always good, especially since the controls here are significantly improved over an earlier version of this I played, which shows a dedication to improvement. Though it has its wrinkles, Nelly 2: Ep.1 is a gorgeous game that paints a vivid dark world full of scares and surprises you'll wish you knew more about. Nelly 2: Ep.1 Walkthrough now available! Turn on the light by pressing the switch on the wall. Walk left to the mirror, interact with it when you see a little girl in the reflection. You can interact with objects when you get a question mark above your head, but there's nothing useful here. Exit to the right. Still nothing to do, carry on. Don't eat the berries. Walk up to the purple glowing thing. Congrats, you have the forest-changing amulet. Press [Z] to grow a plant, then jump on the leaves and onto the tree root. Press [Z] to transform the overgrown crate next to the tree, then push it to the ladder hanging from a branch. Press [Z] to make the ladder appear, then climb it, walk into the tree and down, then right all the way to the end of the chapter. Notice the big bad wolf. Press [Z] to get the lowest part of the ladder, climb it, press [Z] again, climb the next part, press [Z] once more and climb into the old treehouse. There is a box on the branch to the right. Push it to make it fall on the wolf. Climb back down. After you've taken your fluffy buddy, go under the tree and emerge on the other side. Press [Z] to conjure some steps. Press [X] to put your pet down on the button on the ground. When the bar rises, walk under it to the other bar, then press [X] again. Let your pet eat the berry, then jump on it. Push the crate down, call your pet, then jump to your right. See the bunnies block your path with a cupboard. Let your pet eat the berry and become Fluffster again. Jump on your pet and climb the wall to your left. Press [Z] to make a bridge. Go down, take your pet, put it in the little lift. Climb back up, go right to the pulley, press [Z] to get rid of the bridge, then pull your pet up, then press [Z] again to stop it falling back down. Take your pet, go left, let your pet eat the orange berry. Um... climb your pet, then call it. Let the pet eat the orange berry, then use it as a bridge, then call it. Press [Z] to make a bridge, walk all the way right, then down and exit the level. Walk until you find a red berry. Let your pet eat it, then use [spacebar] to latch onto it and float to the other side. When you fall into the tree, grow a red berry, let your pet eat it, then use[spacebar] to latch onto it and float to the other side, avoiding thorns along the way. Walk out to the right. Just walk a bit to the right, the rest of the chapter plays itself out. After you've hidden behind the first bush, press [Z] to conjure another one. Hide behind it when the wolf isn't looking, then continue that way to the third bush. After the third bush, let your pet eat the orange berry, then climb up it. Grow a yellow berry and let your pet transform again. Go right, fall to the lower platform and pull the lever. Call your pet. Press [Z], climb down to the conjured platform. Climb down to the ground, hide in the two bushes, let your pet eat the red berry, use [spacebar] to latch onto it and float to the other side. Go right, fall down to the platform just above the wolf, press [Z] to conjure a crate, climb to the right, keep walking. When your pet is done dismembering the wolf, go down, pick it up, leave. Simply walk to the right. Make sure your pet is in your hands, then walk right to the big mushroom and jump on the platform above. Leave your pet there, then jump down. Take the mushroom, then call your pet so that it falls on the front end of the mushroom. Slowly keep moving to the left, until the pet reaches and eats the yellow berry hanging from the tree. Jump on the pet, onto the branch, up the ladder and keep going to your right. Climb down the platforms. Your pet has eaten the purple berries by now and has turned into a monster, so it'll start chasing you. Run to the right, pressing [Z] to make big boxes disappear and to conjure boxes where you see their outlines. When you reach the signpost, your pet will get tired, so pick it up and leave. Go right until you find a barrel. Leave your pet, move the barrel to the middle of the platform, climb it. Make the berry appear, have your pet eat it, then walk over the pet. Walk past the train to the old building. Move the flower pot to the left, under the left platform, make the berry appear, have your pet eat it, jump on the pet. Pull the rope, climb down, push the pot to the other platform, conjure a berry, have your pet eat it, jump on it, climb the ladder, get the key. Go back to the left until you reach a locked door. Open it with the key and go through the door. Go left, past the first berry bush. When you get to the second one, make the yellow berry appear, let your pet eat it. Climb on the platform, go right, pull the lever. Go down, call your pet. Make the red berry appear, let your pet eat it, hold onto it, land on the first platform to the right. Make the orange berry appear, let your pet eat it, climb over your pet and take the ticket. Climb down and close the door. Give the ticket to the ghostman. It was a nice game, the sounds and graphics set the mood right. Gameplay-wise, I wasn't too thrilled about doing precision-platforming with those decidedly unstable controls, but it was manageable, thus still fair. What I considered unfair was getting hit by an invisible wall of insta-death - apparently due to escaping "too fast" from a pursuer. Still a positive experience overall, and I'm looking forward to the next part. while holding the mushroom, call the pet with x, and bounce it leftward a few times, towards the fruit hanging above. This is a vast improvement over the original. It annoyed me that a game as visually pleasing and simple as Nelly would make me rage quit. The controls were a little jerky, but they where nowhere near as bad as the first. I even like the muted colours of this over the greyscale of the original. Oozing with atmosphere and creepy cuteness, I can't wait for the next chapter. The smaller areas are nice, but the last part of the game in a bigger, more open area is really fantastic and really where the game came into its own for me. I'd be very happy if future episodes had more areas like that, possibly with optional things to collect too. I can't complete level 11! I always die when I reach the last box, just within sight of the railway sign, and I can't see any reason for this. has anyone found all the achievements yet? I keep wanting to get all of them but I'm missing 5. I found a glitch in chapter 11. When I pick up the mushroom it just disappears, and I can no longer move. My pet doesn't try to follow me after that, so I have no way of dying and trying again. Okay, I still don't actually know how I got past level 11, but I did. I either confused the game enough that when I died it put me at the next checkpoint, or I avoided something deadly by jumping on an invisible thing (in both views).